Welcome to our online Junk Food Snack Shop. Our designers will create custom made chocolate and candy gift baskets filled with snacks and treats for any occasion. Let us create the perfect gift basket to suit your needs and budget plus we can hand deliver it the same day. Welcome a new baby, say thank you to a new corporate client or send a special birthday gift present to a friend or family member. Send your daughter or son a chocolate snack junk food basket for their birthday or to their school or college. funerals, wakes and celebration of life ceremonies. We also deliver to all local businesses, hotels and convention centers. 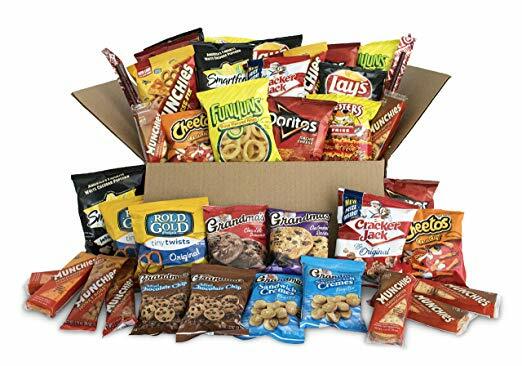 Our Fruit & Snack Gift Basket Company and flower shop offers local florist delivery of handcrafted junk food gift baskets and snack gifts for same day delivery to any city nationwide. In addition to chocolate gift baskets, treats and snacks, we offer gift ideas for every important occasion, making your online gift shopping a successful and rewarding experience. So whether you're looking for a local florist near you to handle your gift delivery fruit selections, or your birthday flowers order, we are your solution. The Gift Basket Connection is an online retailer of gift baskets and flowers delivered by local florists in our network. We create custom gifts delivered directly to you or your recipients door or even a patients hospital bedside. For all same day deliveries we use a local florist or gift basket shop that is actually located in the delivery city. 1- 844-319-9252, for a prompt response. We are also available by live chat. It’s widely believed that the phrase junk food was coined in 1972 by Michael Jacobson, director of the American Center for Science in the Public Interest (a consumer advocacy organization that focuses on health and nutrition). But defining junk food has been a difficult task, partly because the numbers of items are alarmingly high, and also because the food landscape is always changing with new and improved products coming and going almost daily. In defining junk food, the worst ones are most obvious—chips and cookies, coke and colas, and other sugared liquids, candy, and most other snacks. The biggest offenders are sugar (including sucrose, white table sugar, and others such as high fructose corn syrups) and flour, and the thousands of products made from these two deadly ingredients (from ketchup and mayonnaise to energy bars and sports products, and almost all liquid refreshments). For those on the go, junk food is synonymous with fast food, and includes almost all burgers, fries, pizza, fried chicken and foods that are battered or coated or have sauces. Included are the popular “salads,” such as tuna and chicken salad, and even those low-cal dressings. Most international foods are not exempt from the junk food category: Chinese food (high in sugar, starch and or flour), sushi (white rice with added sugar), sweetened teriyaki foods, deep fried fish and chips, and others. Christmas Gift Baskets, Thanksgiving Gift Baskets, Holiday Gift Baskets, City Fruit Gifts, Fruit Gift Baskets city Fruit Gift Baskets, College Gift Baskets, College Care Packages, Sport Gift Baskets, Teacher Gifts, Hospitality Gifts, Grandparents Gift Baskets, Mother's Day Flowers, Mother's Day, Father's Day Gift Basket delivery. Thinking of You Gift Baskets, Doctor's Gift Baskets, Nurses Gift Baskets, Boss's Day Gift Baskets, Easter Cookie Bouquet, Easter Candy Bouquets, Mom's Gift Baskets, Military Gift Baskets, Administrative Assistant's Day Gift Baskets, City Secretary's Day Gift Baskets and any special event or occasion for Christmas or any holiday, we have all the baskets you need to send to family and friends and all your business and corporate clients for admin day or just to say thank you for a job well done.